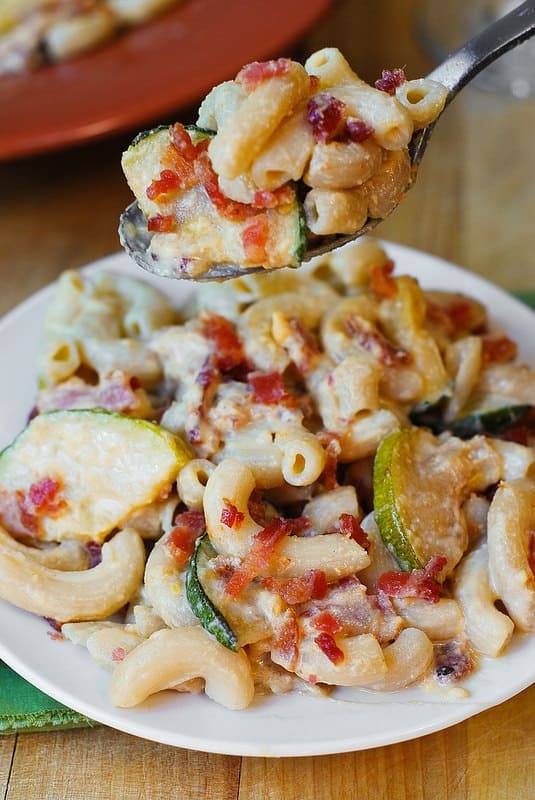 Zucchini Bacon Mac and Cheese made with elbow pasta, half and half, Cheddar and Parmesan cheese. Comfort food. Perfect if you love zucchini. Great Summer pasta recipe! 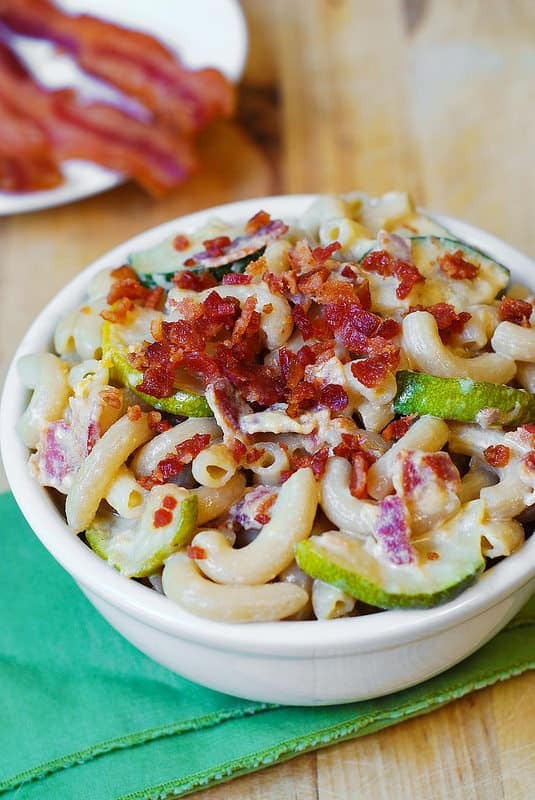 When you combine elbow pasta with bacon, cream and lots of cheeses, you can’t go wrong! 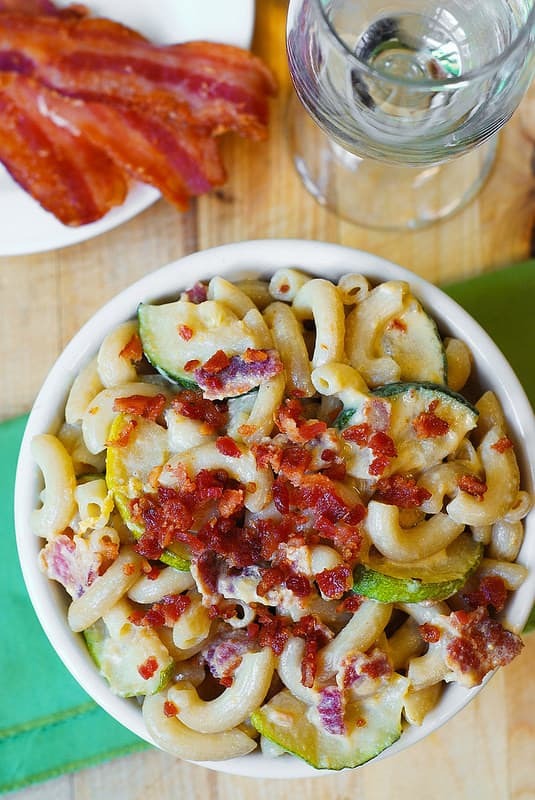 Add zucchini and you’ll have a unique mac and cheese dinner! Parmesan Zucchini Garlic Pasta – light, delicious, Summer recipe. Regular spaghetti pasta combined with garlic zucchini and lots of shredded Parmesan cheese! Chicken and Zucchini Basil Pesto Tortellini – zucchini, chicken, cherry tomatoes, and tortellini are all tossed together with basil pesto to create a light Summer dinner. 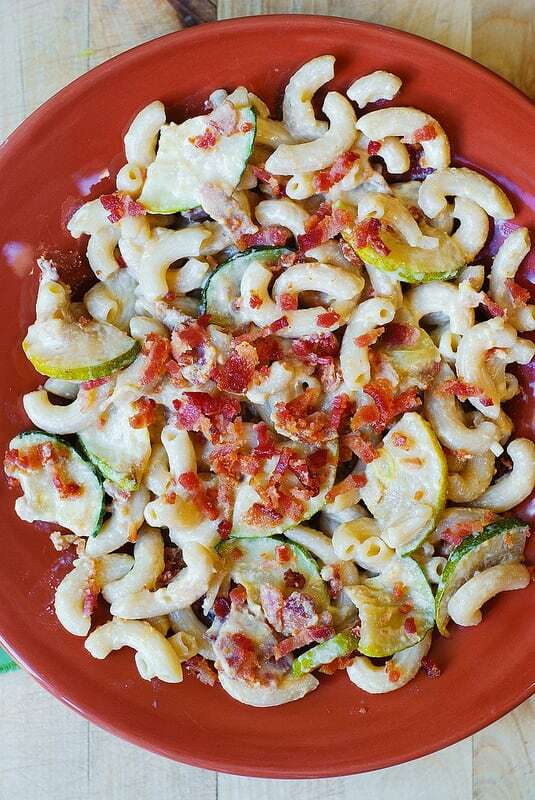 Zucchini Bacon Mac and Cheese made with elbow pasta, half and half, Cheddar and Parmesan cheese. Comfort food. Great Summer pasta recipe! Heat olive oil in a large skillet on medium-high heat. Add sliced zucchini and minced garlic and saute for about 5-7 minutes, occasionally stirring, until zucchini softens and browns a bit, uncovered. Midway through cooking, season with salt. Cook elbow pasta al dente, then rinse with cold water to stop cooking. This is done because you will continue cooking the pasta once you add in cream sauce - and at that point pasta will reach the ideal texture. Return elbow pasta to the pot. Add half and half, bring to boil. Immediately add Cheddar cheese and Parmesan cheese. Reduce to simmer. Cook for several minutes, constantly stirring until cheese melts and coats the pasta. 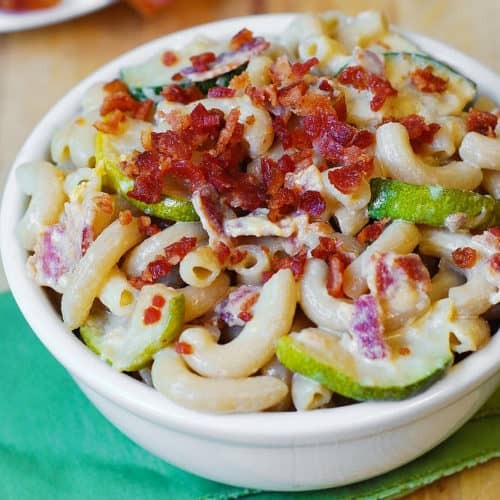 Add chopped bacon (reserving some for garnish) and cooked zucchini from step 1, mix, heat through, turn off heat, and serve, sprinkling each serving with reserved chopped bacon! Absolutely delicious! Thanks for a wonderful recipe! We used turkey bacon and fat free half and half yet it was still yummy! Even my kids who only like the processed boxed mac and cheese thought this was sooo good! Yipee! Thanks, Shelly! I also thought this was such a delicious and simple meal! Great way to use those zucchini right now! I bet turkey bacon was so good! Agree with Shashi, beautiful photos! This has me thinking of bacon and the warm comfort of mac and cheese for dinner. Thanks, Kevin! Love mac and cheese sometimes, especially simple recipe like this one. Your photos do speak for themselves – all that bacon …mmm mmm mmm!